This isn’t your ordinary fan brush. 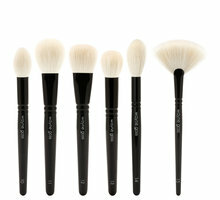 Unlike others on the market, Wayne Goss designed Brush 15 with dense, undyed white bristles and a smaller brush head for better control and color payoff. You’ll feel and see the difference immediately when using it with highlighter and contour powders to brighten, sculpt, and shape your complexion. Precise powdering, hairline contouring, and draping with blush are just a few of the techniques you’ll master with this essential tool. Brush 15 is also available with The Face Set. Glide Brush 15's thin edge along the hollow of the cheek for a carved-out contour line. Pull across the tops of the cheekbones, brow bones, and other high points of the face for flawless highlighting. Brush 15 is also excellent for a final dusting of setting powder over the T-zone. So effortlessly easy to use, it feels incredibly silky and soft. It works super well for an all over finishing powder, cheek highlighter, contouring and of course dusting off excess powder. It is very gentle on skin, and you can really give precise application. Highly recommend! Was hard pressed to find a non-synthetic fan brush. Heard about his brushes through Stephanie from YouTube. Definitely going to give credit when due. It's very good with picking up and holding powders for application, not scratchy, and like the little glove slip it came with: still use it as a protective and to maintain shape. Not sure what the handle is made out of, but would've liked for the handle to have a bit more weight to it and with a slip proof grip. I would pay for this as well because the brush head is very very good. I still give it 5 stars for the quality of the brush head, them being made in Japan, and priced affordable which is why is why I rated it 5 rather than 4. I've been waiting for Wayne's Fan brush to come back in stock, and I'm so glad I did! I have 3 of his brushes, and they are all superb, this one is absolutely brilliant, and very budget friendly too. It's beautifully made, as all his products are, nice quality resin and goat hair, lustrous and soft. The hairs pick up just the right amount of product, and disperse it evenly on your face. The handle is decent weight, not flimsy or overly heavy and the perfect length for standard brush rolls and containers. I highly recommend this brush! If you're looking for light, precise application of highlighter, bronzer, contour, etc: you can't go wrong with this sweet little brush. I love using it at my hairline to apply bronzer or contour, and I simply can't mess up my highlighter application with this brush. I might be in the minority here but I've found that I don't use this brush as often as a I thought I would. This fan brush isn't very compatible with gelee highlighters or higlighters that are packed more densely into the pan (i.e. Jouer highlighters) so I don't find myself reaching for this as often as I thought I would. It's perfectly fine as a fan brush but just be forewarned that the hairs on the edge have a tendency to splay if you don't take measures to keep this in its proper shape. Perfect for high cheek highlighter application! I have a heavy hand so this brush really helps to pick up and apply the right amount. I tried finding a fan brush but found many to be too flimsy and not as dense in hair, but this is perfect! A gorjeous face brush and i use it to apply highlight powders, so soft the brush and when applying highlighter it gives a diffuse application but yet if you use it for beaming highlights it gives the most gorgeous shine above your cheeks. I love it!! Truly gives an even application. I had the original Wayne Goss fan brush and gave it away. It was very nice, but too large for my taste. This new fan brush is smaller and thinner and easier for me to highlight with. I feel like the size is perfect for highlighting because you can't overdo it. It is as soft as the first one and just as well made. I heard about Wayne Goss and tried this brush because Stephanie Nicole (Youtube) said they were really good and specified this was her favorite for highlighter. She was not lying I tried this brush and its amazing, super soft and good control. I really need a new face brush after getting this because now everything else I have which are Elf Brushes feels like straw in comparison... 1st world problems, so Ill take my time replacing. Id highly recommend this brush. I wasn't having any doubts about this brush. Considering I already knew how I was gonna feel about it, which lead me into buying more of his brushes. they are so soft on the skin and blend powders so beautifully. 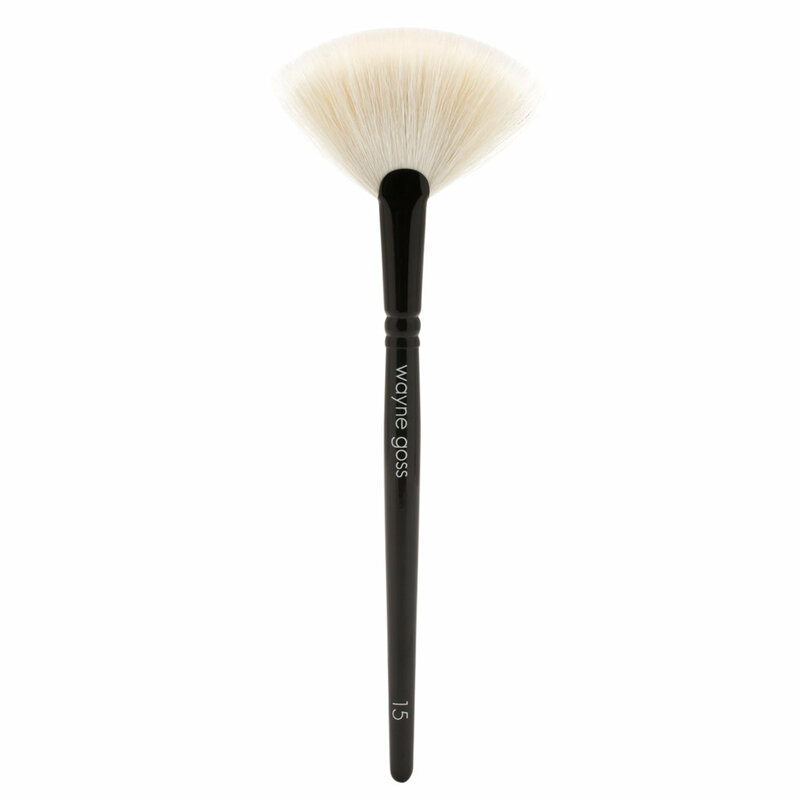 I use this fan brush only for applying powder highlights. For how much i have spend on the brush, I have only washed my W.G. brushes once so far. I would only wash them once a month Because I want mine to last a long time and continue to be as soft and silky feeling like the first time I've used them.